A month with a trackhoe on two acres of land in rural Madison County brings a whole new meaning to the term "rock and roll." My son Josh (pictured on the left below) said he started feeling that the industrial strength excavating machine was an extension of his body and admitted to feeling god-like moving so many huge boulders around. 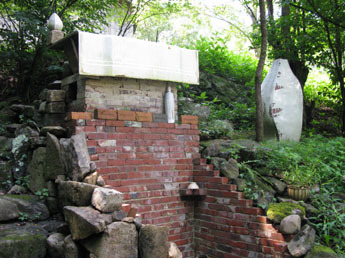 It had been a year since I last visited Josh's property, home of the 3 chambered Noborigama kiln The Community Temple. 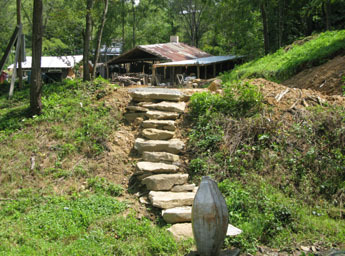 Although the site reflected the work of the twelve Carolina Kiln Build potters currently in the midst of building two new kilns, the new landscape taking shape was evident in the rock retaining walls, the labyrinth of stone stairways and walkways, and an open grassy terrace overlooking the kiln and studio. Down at Josh's living space by the creek, a stone walkway away from the kilns and studio, I was surprised to see a raised bed vegetable garden and sunflowers starting to bend. 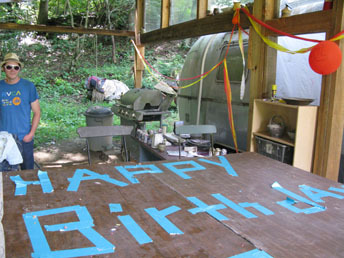 There were balloons and neon silly string hanging from the Airstream's porch rafters where the group had recently celebrated the 31st birthday of Eric Knoche, who is co-facilitating the workshop with Josh. Around back, an outdoor tub tucked into the woods next to the composting outhouse now stands as an invitation to a peaceful pause. With the creek water running and clay pots set around the stone pedestal wall that holds up the tub, it brings to mind an ancient bathing ceremony fit for the Buddha himself. Post note: Photos of the Carolina Kiln Build and the new anagama kilns, the Burrow and the Land Shark, will be posted on Friday. A first video tease of Josh showing Joe the two new kilns twelve days into the three week build is HERE. What a neat place. At the end of the day, I wouldn't mind trying out that tub! Sounds like he is moving along toward a permanent haven. You must be very proud. I don't know why you were surprised; the apple doesn't fall far from the tree :) (Here I'd like to know how to go HERE on your blog and link to the sunflowers and gardens, etc.) Nice video, I enjoyed seeing Josh and his work. I see how one get creative here.. I was surprised that he had any time to plant vegetables and flowers. He's a hard worker and barely ever stops. I was happy to see them because it means "balance." I have a photo coming up soon of one of his sunflowers, Chris.